The Australian government had paid US $ 23 million for advertising campaigns in last year to discourage people from countries such as Sri Lanka, Pakistan and Afghanistan from seeking asylum in Australia. According to the advertising agency, TBWA/TAL, the ad campaigns appeared on television, radio, online and in leaflet drops in countries such as Afghanistan, Pakistan, Iran, Sri Lanka and Sudan. The campaigns had names such as ‘No way. 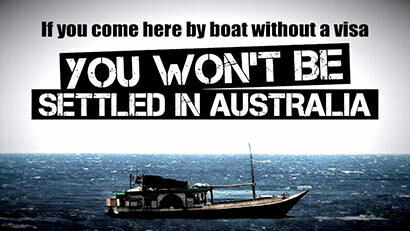 You will not make Australia home’ and ‘Don’t throw your money into water’, which urged would-be asylum seekers not to pay people smugglers for dangerous sea journeys. The sum, released by the Australian Audit Office in response to questions asked in Senate estimates, covers spending by the Immigration and Customs departments between July 2013 and August 2014, Fairfax Media reports. The money was spent under both the current Coalition government, which came to power last September, and the previous Labor government. She said the money should have been spent on a “genuine regional framework, based on increased refugee processing and resettlement”.